I think we all have this terrible feeling that our blemishes or else are the only thing someone sees when they look at us. Concealer is the one staple in a woman's beauty arsenal that can dramatically change your appearance. Used correctly, concealer can brighten a tired face, it can cover up blemishes and it can totally conceal under-eye circles. 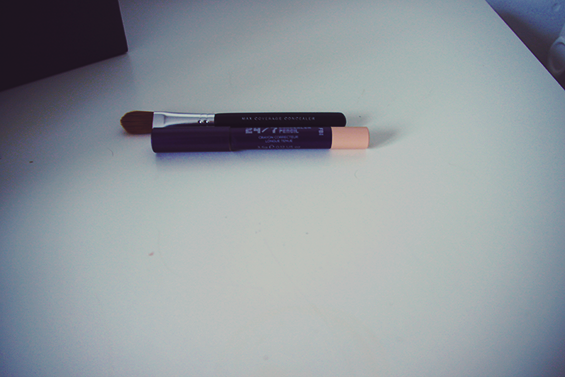 First, you need to choose your perfect concealer. My basic rule of thumb is to choose a concealer that's yellow-based and a shade or 2 lighter than your skin tone. If your skin is darker in summer, you should choose a darker shade for summer months and a lighter one for the rest of the year. Once you have your concealer (for me, my new favourite is FBI from Urban Decay), you will need to apply it on your face. For under-eye circles, apply concealer first, then foundation. For blemishes and pimple coverage, apply foundation first or the concealer will vanished due to the foundation. Concealer looks most natural when you work in "sheer layers and build it up gradually," according to the editors of Allure's "Confessions of a Beauty Editor." 1. I apply several dots of concealer under the eyes close to the lashes and inside corners of the eyes. I use my fingers or a small-headed brush with firm bristles. 2. Using the pad of your middle finger (since I find this finger more gentle), I tap in the concealer (always tap gently, never rub) and be careful to blend it well. 3. I apply it on other uneven spots on the face -- including the chin, and around the nose and mouth if needed -- and tap in. 4. I dust fine. I apply loose powder over my face to set my concealer. According to makeup artist Scott Barnes in Allure Magazine, loose powder applied with a fluffy brush is "the secret to good concealer."